This here is a cautionary tale about good intentions gone awry. (“Cuomo’s $15 Million High-Tech Film Studio? It’s a Flop”, NYTimes, 8/22) The story starts innocently enough. The goal was to create jobs in an area with a struggling economy. In this case the State of New York invested $15 million in the creation of a high-tech film studio. The idea was to “build a sustainable film industry in Central New York from the ground up” according to this press release. So why all this discussion about regional economic trends and clusters? Aren’t we talking about neighborhoods? Well, without the region there is no neighborhood economy. So when it comes to developing a viable neighborhood economic development strategy we need to next these efforts within a larger regional market. This means identifying industries that are already making a go of the opportunities and competitive advantages of an area, from a skilled labor force to critical infrastructure to the presence of complimentary firms. These are all the factors that enable a business to generate profit. Consider the unique local factors that led Hershey to build his factory in Pennsylvania–proximity to lots and lots of cows who produce milk, the main commodity in milk chocolate. Or why Detroit’s auto industry has stuck it out in Detroit–there exist a cluster of suppliers, manufacturers, distributions, researchers, etc. that are quite difficult to move and replicate elsewhere. Putting these clusters on a more aggressive growth trajectory, whereby they are able to lower costs, grow profits, hire more people and fill more vacant real estate space is the opportunity that we have in our urban neighborhoods. growth strategy in low-income urban neighborhoods. 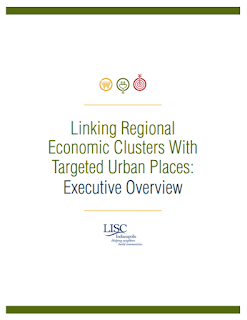 The Indianapolis chapter of the Local Initiative Support Corporation (LISC) is helping lead an effort of this kind by commissioning an report that served as a guide for industrial investment strategies in urban places. The findings? Three clusters showed “particular promise and a competitive edge for Indianapolis…Food Manufacturing and Distribution, Business to Business (B2B) and Technology.” The recommendations offer the beginning of a road map for how LISC, one of the nation’s largest CDFI’s, can help grow industry clusters through targeted, place-based real investments. Some notable recommendations include supporting feasibility analysis for industrial buildings and developing accessible expertise around site selection, industrial building re-use and conversion. Another approach is helping to absorb build out costs for the kinds of capital investments necessary for the Food Manufacturing Cluster. Ensuring space can accomodate enhanced refrigeration and electrical loads, or can support high-quality processing and distribution all while maintaining high health and safety standards requires a site by site analysis to determine feasibility and any gap financing needed to make a project viable. The solutions aren’t always easy – in some cases they involve developing regional working groups that will open lines of communication between the public and private sectors to guide and inform investment and policy initiatives over time. As it turns out, engaging a broad spectrum of private sector partners and ground-truthing potential public investments might have made a difference between a great New York Times piece and an embarrassing one.